Mr. Dan Keppen Dan Keppen and Associates, Inc.
Mr. Mark Deutschman Houston Engineering, Inc.
Mr. Brian Fischer Houston Engineering, Inc. The collaborators for the development of the Klamath County DSS include the contractors selected to develop the site, Houston Engineering, Inc. and Dan Keppen and Associates. 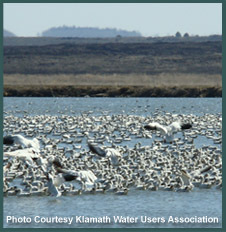 Many thanks to those that provided information for use on the Klamath Basin DSS, especially those within the Bureau of Reclamation, the U.S. Forest Service, the Bureau of Reclamation, the Bureau of Land Management and the Natural Resources Conservation Service.